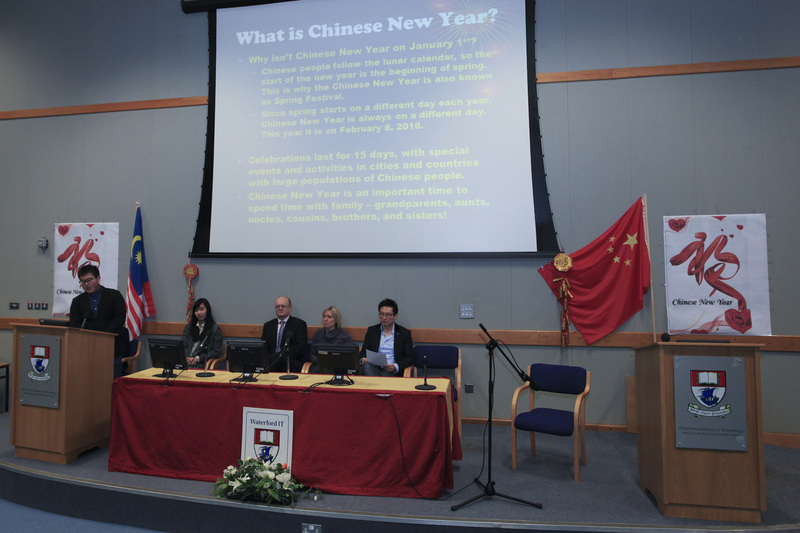 The 2016 Chinese new year celebration at WIT was organised by International office, supported by WIT Chinese Students and Scholars Association (CSSA), and WIT Malaysian Students Association (MSA) on 4 February. In the main auditorium student representatives from CSSA and MSA gave very interesting presentations about the how Chinese and Malaysian people celebrate the Chinese New Year at home. A Chinese lecturer from the school of Engineering gave a very good story about his own experience from a English language foundation student to a degree student in Engineering, then to a postgraduate student. Currently is a PhD student to a full time WIT lecturer in Engineering. In addition, Chinese students gave a performance in singing, and playing traditional Chinese Instruments, such as PiPa (Lute), and Chinese flute. Outside of the auditorium, some students gave a demonstration on Chinese Calligraphy. This attracted many other students to get their name in Chinese. The Asian finger food was provided by the campus service. The delicious Asian noodles and the spring rolls were very popular by the students and staff. That evening CSSA and MSA also organised a special party in Dome Bar to celebrate the Chinese New Year - the year of the Monkey.